Our first paper on guppies (Poecilia reticulata) is out in Science Advances! We compared decision making in groups from rivers varying in predation level, and found that there’s a more of a leader-follower system in fish from high predation habitats. The paper is Open Access, so can be read by anyone. Collective decisions play a major role in the benefits that animals gain from living in groups. Although the mechanisms of how groups collectively make decisions have been extensively researched, the response of within-group dynamics to ecological conditions is virtually unknown, despite adaptation to the environment being a cornerstone in biology. We investigate how within-group interactions during exploration of a novel environment are shaped by predation, a major influence on the behavior of prey species. 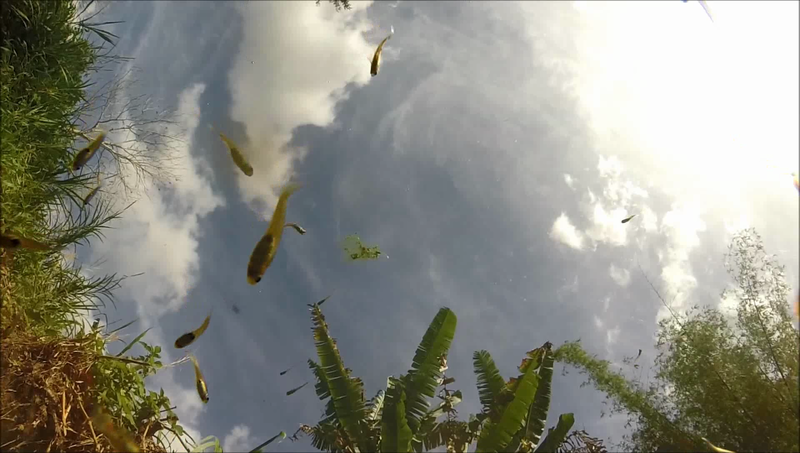 We tested guppies (Poecilia reticulata) from rivers varying in predation risk under controlled laboratory conditions and find the first evidence of differences in group interactions between animals adapted to different levels of predation. Fish from high-predation habitats showed the strongest negative relationship between initiating movements and following others, which resulted in less variability in the total number of movements made between individuals. This relationship between initiating movements and following others was associated with differentiation into initiators and followers, which was only observed in fish from high-predation rivers. The differentiation occurred rapidly, as trials lasted 5 min, and was related to shoal cohesion, where more diverse groups from high-predation habitats were more cohesive. Our results show that even within a single species over a small geographical range, decision-making in a social context can vary with local ecological factors. 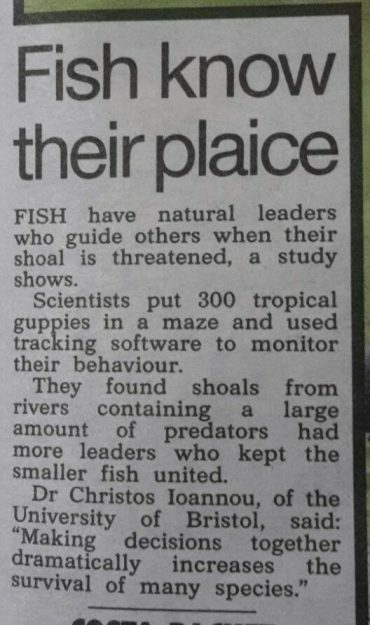 The study was covered in The Times, The Independent, The Scotsman, and even The Sun (both online and in print below! ).